Letter of the week: Is this the best the political parties in Hartlepool can come up with? 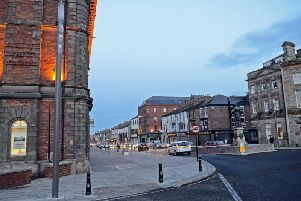 Councillors represent their wards at Hartlepool Civic Centre. On April 17 I received an envelope containing my postal vote for the forthcoming Hartlepool Borough Council elections. I eagerly opened the envelope to ascertain who the candidates for the north park area of Jesmond ward were but I simply wasted my time. I should have consigned the envelope, unopened, to the grey bin. However, I am of the opinion that if you do not vote you do not have the right to complain. Not knowing anything about any of the four candidates, nor having seen any of the four candidates on their campaign trail, nor knowing anything about their political views I was left in a quandary. I was left with the option of deciding which of the four reflected my views and political beliefs from the scant information on the voting form. First on the list was someone from the Green Party. A lone voice in the wilderness representing people who hug trees and are against everything all the other political parties stand for. One lone voice on the council which the gallant 34 other councillors would simply ignore. Second on the list was a man living on the Bishop Cuthbert estate. My question would be why does a person living in that area of Hartlepool wish to represent people in the Jesmond ward? Also what are this man’s political views? Does he share the same views as Jeremy Corbyn, McCluskey, McDonnell, Tony Blair and New Labour, or John Prescott and old Labour? Is he Marxist, Communist, Socialist or simply someone looking for a safe seat and an extra supplement to his pension? Third on the list is another non-starter. Another person from another part of town parachuted into the Jesmond ward, who says he wants to represent me on the council. Another person from another minor party with no real say on the council, who the gallant 34 would simply consider an irritant to their authority and power. Fourth on the list is yet again someone from outside the area hoping represent the people of north park in the Jesmond ward. I really feel sorry for the people of this area of Jesmond ward if, out of approximately 3,000 residents to choose from, this is the best the political parties in Hartlepool can come up with. Last week's Letter of the week: Obesity is a national crisis which won't go away.